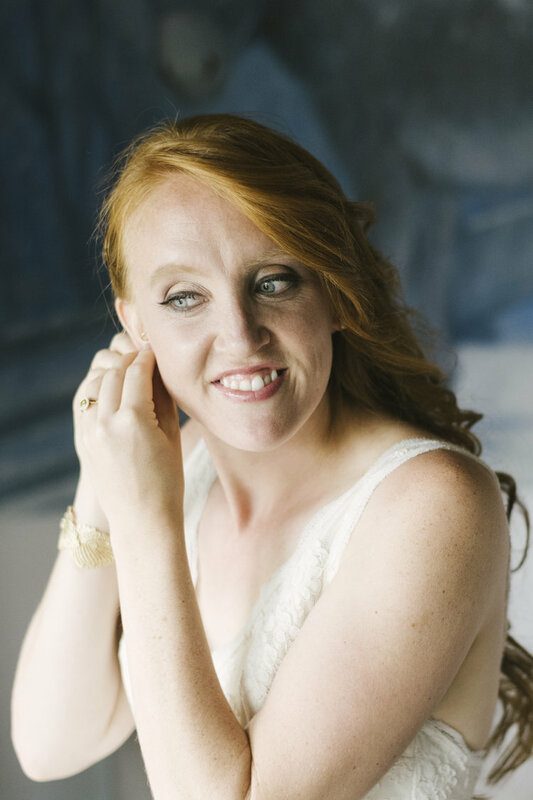 Planning a wedding is supposed to be a joyous and fun affair, but sometimes there are major setbacks that threaten to eclipse the happiness. Unfortunately, awesome couple Kaitlyn and Rachel had to deal with a number of these. Even though they were such great people and had wonderful creative ideas, there were a lot of vendors who didn’t want to be a part of the wedding because the couple was lesbian. It was frustrating, to say the least! But struggle always makes success all the more sweet. Determined not to let these hinderances dim their shine or let bigotry dampen their spirit, the happy couple went on to have one of the greatest, happiest weddings we’ve had the honor of putting together. 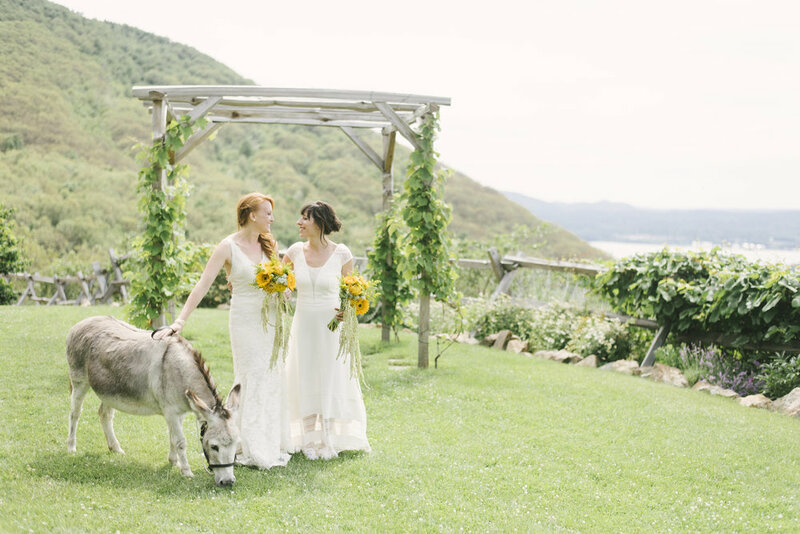 The wedding took place in Beacon, New York, with a beautiful Hudson Valley backdrop that allowed their rustic-chic July nuptials to really shine. 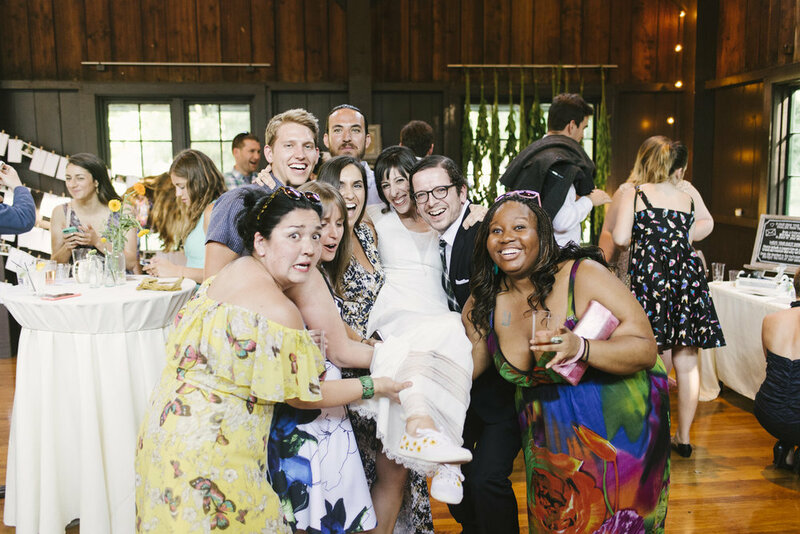 The wedding was a colorful, bright celebration with a lot of quirk and character—much like the couple themselves. To really give the wedding a summery vibe, Tiny Hearts Farm created bouquets of sunflowers and other vibrant yellow blooms for a look that really popped. It fit in perfectly with the outdoor ceremony and its vintage farm charm. Rachel and Kaitlyn really wanted to bring in lots of elements of nature into their wedding decor, so floral accents—both large and small—were everywhere during the ceremony and reception. The steps leading up to the porch where they lovingly exchanged “I do” was cleverly decorated with greenery and sunflowers for an overgrown-on-purpose, whimsical touch. The brides even wore canvas sneakers with a fun allover sunflower print! For a really fun, unconventional take on an old tradition, guests were given sprinkles instead of rice or confetti to toss on the newlyweds. Making the most of the generous outdoor space, games like croquet and a beanbag toss were available for guests to partake in at their leisure. It made for some really great (and at times, maybe even a little competitive) entertainment! The reception dining took place under a massive tent that was pure magic. With romantic strings of light, lush floral garlands running down each table, and cute trays with a personalized stamp of the couple, the effect was warm and elegant. After dining, guests relocated to an indoor space—but the outdoors came in with them! The brilliant talent at Tiny Hearts Farm created a giant hanging floral structure that added a beautiful element of summer greenery to the space. As guests shimmied and glided across the dance floor, they also enjoyed delicious treats set out on the sweets table. A selection of the couple’s favorites, the menu included doughnuts, cookies, and a Momofuku-inspired cake that was made for them by a friend…and, of course, it was decorated with sunflowers! Kaitlyn and Rachel love to travel, so they wanted to include their fondness for foreign exploration into the reception theme. Instead of a traditional guestbook, they opted for a two-part process. Each guest’s name was written on an envelope and placed along a cord. Using a provided Polaroid camera, guests took a photo of themselves and replaced their envelope with the picture. They then wrote a suggestion for their favorite travel destination, placed it in their envelope, and dropped it into a suitcase. It made for a very meaningful and truly unique collection of memories for the couple! As a parting gift, guests took home adorable miniature succulent terrariums as favors. This was one wedding that really made lemonade out of lemons. Kaitlyn and Rachel’s irrepressible joy in spite of some very sad disappointments made this wedding one we won’t soon forget. We loved working with them and wish them all the very best! At Björn & Company, we take pride in creating beautiful weddings for all couples. No wedding is too big or too small, and our years of expertise and industry know-how have brought countless unique visions and ideas to life. To learn more about our weddings and the services we provide, click here.